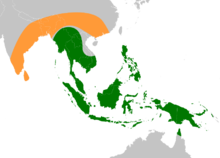 Original native ranges of the ancestors of modern edible bananas: M. acuminata is shown in green and M. balbisiana in orange. ↑ Edmond de Langhe & Pierre de Maret (2004). 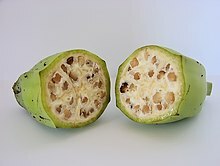 "Tracking the banana: its significance in early agriculture". In Jon G. Hather. The Prehistory of Food: Appetites for Change. Routledge. পৃষ্ঠা. 372. ISBN 978-0-203-20338-5. https://books.google.com/books?id=DMgKW9HleFoC&lpg=PP1&pg=PA372#v=onepage&q&f=false.